ABT's two-week fall rep season at the Koch included a production premiere of Raymonda Divertissements, choreographed by Petipa with staging by Irina Kolpakova and Artistic Director Kevin McKenzie. Hee Seo and James Whiteside danced the leads, interesting complements of cool and hot, both with crisp, taut lines. The duo of Misty Copeland and Sarah Lane were warmly energetic and well-matched. Corps member Skylar Brandt danced a solo with lucidity, and soloist Christine Shevchenko once again demonstrated her burnished technique that has garnered her more and more roles. One thing that struck me immediately was how big the larger group of four corps men looked on the Koch stage (as exemplified by Alex Hammoudi); this is New York City Ballet's house, and the men are generally smaller in stature. Although ABT's ensemble men looked as if they could use another week of rehearsal, all nine couples performed shoulder lifts smoothly. The ballet is a reliable, classical confection and repertory staple, if a tad dry, to hummable music by Glazounov, costumed in hues of vanilla cream frosting by Barbara Matera. How is it possible to distinguish Fancy Free, that 1944 Jerome Robbins staple to Leonard Bernstein (here staged by NYCB's Jean-Pierre Frohlich), performed with clockwork regularity in New York? How about Cornejo's triple tours en l'air into splits, and Marcelo Gomes' unfettered goofiness? Add in an aw-shucks sweetness by Cory Stearns, and welcome appearances by Stella Abrera and Gillian Murphy, and you have a rejuvenated vehicle with sparkle and pyrotechnics. 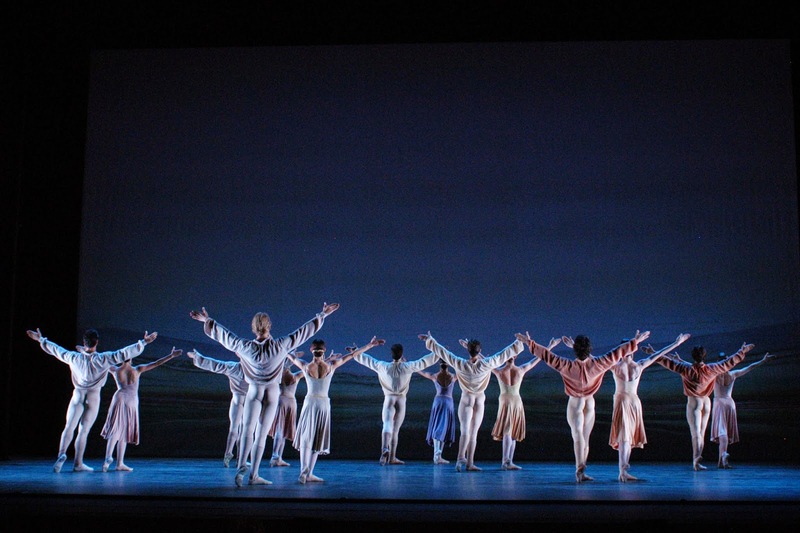 Frederick Ashton's Jardin aux Lilas was staged for the company by Amanda McKerrow and John Gardner. In the ballet's few years' absence from the rep, I'd forgotten how succinct and probing Ashton's choreography can be. Simple head turns, body direction changes, and lifted hands speak volumes about the players' psychological states. Two couples in love with the others' partners arrange furtive trysts in the sylvan moonlight, wary of being caught. Its simplicity and humanity makes you yearn for more Ashton. Chris Wheeldon's Thirteen Diversions (2011), to Britten, is a handsome, elegant dance for 24. Bob Crowley's silver and black costumes, and Brad Field's at times retina-searing lighting, underscore the ambition of the dance. But it hints at a weakness for the ubiquitous Wheeldon, in that apart from narrative ballets and icons such as After the Rain, he creates lovely, flowing dances that can be indistinguishable. However, it did match Boylston with Stearns, another unexpected, satisfying pairing. As the title of the premiere With a Chance of Rain suggests, its choreographer Liam Scarlett is also very much in the air these days, landing here and there like a passing shower (he just had a premiere at NYCB). It's a handsome piece, with the dancers' honed, athletic physiques in full display in separates designed by Scarlett. To a selection of piano music by Rachmaninoff, played by Emily Wong, Gomes led off with a subtle circle of his shoulders, growing into curving arms and a pulsing torso. He is so fluid and cool that he makes the most difficult steps look deceptively easy (Cornejo also has this gift). Sarah Lane in Seven Sonatas. Misty Copeland and James Whiteside had a more aggressive duet, and several odd lifts. Perhaps inspired by their highly sculpted physiques, Scarlett seemed to go with the flow, giving them groping and jiggling gestures that jolted the otherwise serious or contemplative mood. At one point, Gomes silently replaced Copeland as she was groped, giving the sheepish Whiteside a surprise. Hee Seo is not often associated with ABT's modern rep, so it was good to see her paired with Gomes. Joseph Gorak, as always, distinguished himself with crispness, delicacy, and lucidity. The final program I saw was filled with beauty and formalism by three quite different choreographers. Twyla Tharp's Bach Partita (1983, here staged by Susan Jones) hasn't aged much, with its ivory-to-mocha shorts and dresses by Santo Loquasto. The company's fall season features some of the less-seen corps, and here, April Giangeruso—flexible and luminous—shone in her duets with the velvety, noble Eric Tamm. Isabella Boylston and Craig Salstein both fleet dynamos, connect well with the audience and one another. Paloma Herrera looked sharp in an extended solo section, whipping through fouettés, and slowly pointing her fabulous foot to remind us what we'll be missing next year after she retires. She reunited with her one-time frequent partner Gomes; they struck the final arabesque and lunge pose immortalized in the season's ads, in which they gaze directly at us. 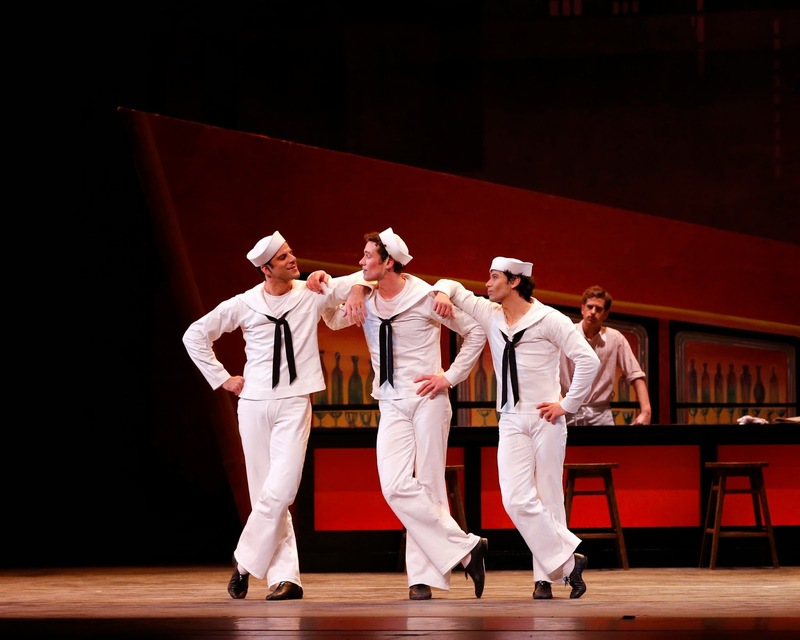 Seven Sonatas (2009), by Alex Ratmansky, featured two more corps members prominently: Blaine Hoven and Arron Scott, both nudging toward promotions, judging by their stage time. Hoven had a lengthy duet with Veronika Part, a somewhat unlikely, intriguing pairing. Part, who comes across as appealingly vulnerable, perhaps helped Hoven reveal new dimensions in his dancing, but we have yet to see him relax into full expressiveness. Scott dazzled with his deft musicality and split jumps. Sarah Lane, who also danced in the Tharp work, impressed with her endurance and craftsmanship, as always. And new soloists Shevchenko and Alexander Hammoudi brandished their newfound authority, she dancing with flourish and finesse, and he with regal bearing. For Jiri Kylian's Sinfonietta (1991), the brass instrumentalists stand on the stage's side aprons for the opening and closing fanfares by Janacek. There's nothing subtle about it, nor about Kylian's choreography, which here is all about rapid-fire leaps, explosiveness, and ballon. The big revelation was the pairing of Gomes and Whiteside, so well-matched and in tune that they appeared as mirror images for their multiple circuits around the stage. It was refreshing to see the women in soft shoes, giving them a more supple, sound footing; Gillian Murphy was radiant as usual in her section with four men. Kylian makes bold shapes—human as cruciform, flat backed bends, flexed feet. His aptitude with geometry, and his classical roots, fit well on ABT. The company is going through a phase of transition, with Herrera, Julie Kent, and Xiomara Reyes retiring in the spring. There were no guest principals in the fall season, which emphasized the young talent in the ranks. The male principals have nearly all turned over since a few years ago. It's a safe bet that new principals will come partly from within, and partly from external sources (cough*Bolshoi*cough). (A couple of springtime regulars—Natalia Osipova and Ivan Vasiliev—perform next week at the Koch with the Mikhailovsky Ballet, after departing the Bolshoi.) Hopefully David Hallberg will be healthy; Misty Copeland is slated to star in Swan Lake and Romeo & Juliet for the first time; will she be named a principal accordingly? Change is afoot; suspense the only certainty.